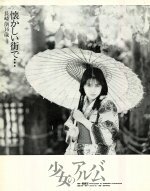 There is a 4 page color photo collection on "Sixteen" year old Nagai Nobuko (永井信子). There is one picture of Nobuko wearing a sailor fuku, a two page spread of Nobuko wearing a white bikini, and one picture of Nobuko sitting down, wearing a white bikini. There is also a 2 page, pull-out calendar of Nobuko, wearing a white bikini. There is a 4 page monochrome photo collection on "16 year old" Nagasaki Moe (長崎萠). There are pictures of Moe wearing a kimono and a cute frilly one piece.